"Jay is uniquely qualified to help you communicate more clearly. His strong technical skills are enhanced by a patient and supportive coaching style." Develop a strong, clear, rich, and effective voice – one others will find attractive and persuasive. 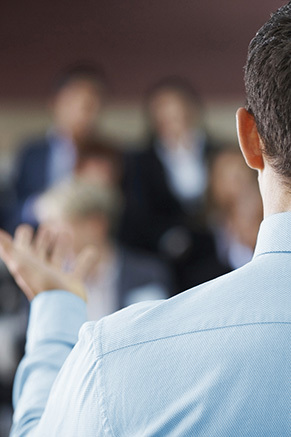 Manage nervousness, build self-confidence, and deliver compelling messages. Quickly develop effective skills to handle the media – both on and off camera. Could you benefit from voice lessons in Toronto? A vocal coach from Voice & Speech can help you make optimal use of your speaking voice, and gain confidence in front of an audience. Or perhaps you need media or presentation training? Toronto voice coach Jay Miller, and his associates, offer a range of voice and speech services, including voice lessons, public speaking training, presentation skills training, on-camera media training, accent reduction, and speech writing. Jay is uniquely qualified to help you communicate more clearly. He has a degree in Speech Language and Hearing Sciences from Temple University, and both a Master of Fine Arts degree and Voice Teaching diploma from York University. His strong technical skills are enhanced by a patient and supportive coaching style. Jay's education in speech sciences and performing arts, combined with his experience as a speaker and instructor, has allowed him to assist a wide variety of business clients. For over 15 years, he's provided voice lessons and public speaking training in Toronto to many Fortune 500 companies, developing a reputation as one of Canada's finest vocal coaches. Would you like to learn more about voice lessons in Toronto? Public speaking training? How to polish your presentation skills or be your best in a media interview? Contact us!